Terminology and Regulations. ‘Exam’ is the term we use to describe official University-run exams, while we called in-class, physics-run written assessments ‘Tests’. As such, Exams are scheduled in University-designated weeks and are subject to a number of University Regulations. Missing An Exam. The University expects students to be available for the entire Exams period designated for each module. This facilitates unexpected and rare events, such as re-scheduling due to extreme weather conditions. You should thus not book holidays during your Exam periods. Missing an examination may have very serious consequences for your studies. In such an event, you should consider whether the circumstances may allow you to submit a Personal Mitigating Circumstances (PMC) case. Details of the PMC process can be found within the Academic Policies section of the University website (listed under ‘P’). Exact Timing of Individual Exams. The University co-ordinates exact timing and timetables for official examinations. It is the University, and not Academic Departments such as Physics, that organises exactly when each Exam will be scheduled. The University then notifies students in the weeks leading up to each Exam period. January Exam Period. A ‘short-fat’ one-semester module, such as Mathematics in semester 1, can be examined in the following exam period. So, Mathematics has an Exam in the January Exams period. 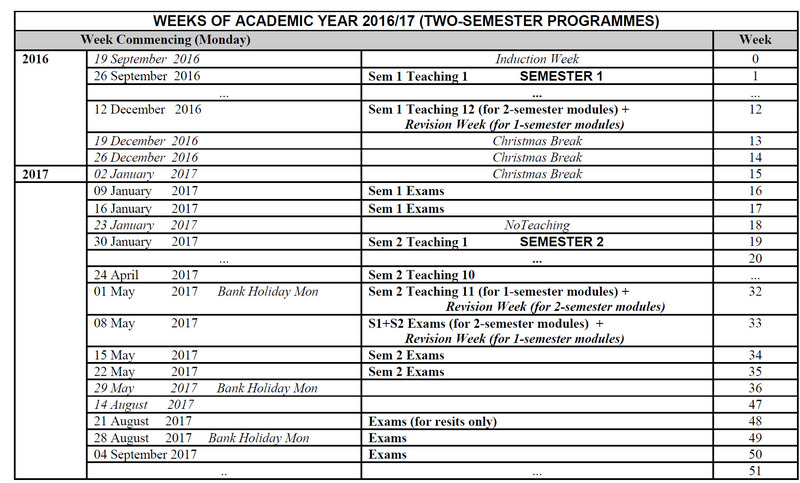 For some ‘long-thin’ two-semester modules, such as the Fundamentals of Physics modules, formal examination is not until the May Exam period. May Exam Period. 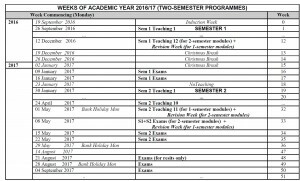 There can also be ‘short-fat’ one-semester modules in the second semester, such as Mathematics and Computing. The May Exam period for two-semester modules stretches over three weeks, whereas one-semester modules, such as Mathematics and Computing, are examined in the last two weeks of the May Exam period. Revision Weeks. In Physics, we try to avoid delivering new subject matter in the teaching week prior to the corresponding Exam period. Though, for some of the ‘busier courses’, this cannot always be guaranteed. We call this week prior to an examination week a ‘Revision Week’. So, revision weeks can be in different periods for one-semester and two-semester modules – as the Exam periods for such modules can be different. Summer Reassessments. For students who do progress to the following year by the end of the May Exam period, there is a summer reassessment period which includes a formal August/September Exam period. Resit Exams tend to be held in the first two weeks of that three week Exam period. Progression. Students on the BSc programmes will progress through the programme in line with the Academic Regulations for Taught Programmes. Students on Integrated Master’s programmes will progress through the programme in line with the Academic Regulations for Taught Programmes with one exception. In order to progress from Level 5 to Level 6 and Level 6 to Level 7, students must accumulate 120 credits at Level 5 and Level 6; students must also achieve a Level 6 mark of 50% or more. Students who achieve a module mark of less than 50% at Level 6 shall be permitted to be reassessed for each assessed component where a mark of less than 50% was achieved, or to retake the module. At reassessment, component marks will be capped at 50%. If the student has retaken the module, the module mark shall be calculated entirely from the new component marks and grades achieved at that point and the overall module mark capped at 50%. For the purposes of the degree classification, the revised mark capped at 50% will only apply to the integrated master’s award. If an honours degree is to be awarded as an Intermediate Terminating Qualification (ITQ) then the original marks obtained at first sit will apply if above 40%. Otherwise the component mark is capped at 40% following reassessment for failure at first sit or, if re-taken, the overall module mark is capped at 40%.